All the information you need about Sitges. Not only for residents but also for casual visitors, people interested in moving to Sitges, residents of surrounding towns or indeed anyone with an interest in Sitges. Information covers cultural activities, festivals, social activities, bureaucratic procedures, schooling, leisure activities, associations, special offers, transport, shops, parking and a large etc. We offer information and answers to all issues that may arise when living, visiting or planning to live in Sitges - all on one site. To receive regular information on the cultural and festive activities happening in Sitges as well as current promotions, kindly subscribe to our newsletter. If you have any questions that remain un-answered on this web, you wish to make a suggestion or there is information you would like to see included, contact us. 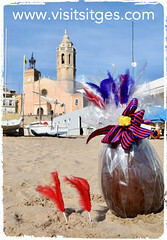 If you would like to offer business promotions to visitors and residents of Sitges, contact us. Sitges is a Mediterranean coastal town, located in the Garraf area in the province of Barcelona, in Catalonia, Spain. Sheltered by the Garraf mountains and due to its geographical position in the Mediterranean, Sitges has a warm "micro-climate" that makes it possible to enjoy outdoor activities almost every day of the year. Moreover, throughout the year numerous events take place in this beautiful town: the Sitges International Fantastic Film Festival of Catalonia, Carnival, the Festa Major, Theatre Festivals, The Barcelona-Sitges Vintage Car Rally, Harvest Festival, concerts ... the list goes on, however one can also enjoy simply taking a stroll along the sea-front boulevard, a bike ride through the Garraf Natural Park or soak up the atmosphere of the Sitges nights on the renowned "Dos de Mayo" street. Four kilometres of beach with a delightful sea-front promenade featuring turn of the 20th century colonial "Indiano" mansions on one side and the sea on the other, makes it always a good excuse for a trip to Sitges. Sitges with its year-round mild climate and coastal location offers a wide range of sports and water-sport activities. Numerous sports events are held throughout the year such as the Mitja Sitges (Half Marathon), the annual Triathlon, Beach Rugby 7, sailing regattas, 3x3 basketball and football tournaments. Cultural events always highlight the Sitges calendar throughout the year and include theatre festivals, the International Film Festival, renowned art exhibitions, Carnival, Sitgestiu Cultural organized by Museus de Sitges with daily events during the three summer months, classical and contemporary music concerts, international events such as the Patchwork meet, the vintage Barcelona-Sitges Car Rally or our local fiesta mayor with its exceptional firework display that draws thousands of spectators to the beaches to watch. The list goes on! Family-friendly Sitges also offers play areas for children such as the large shady Terramar Park with picnic areas and swings, the sandy beaches, the waterfront promenade ideal for roller skating and biking and the local Natural Park of Garraf to enjoy nature. Activities for children include the Christmas Fun Park, the 3 Kings procession of Epiphany, the Junior Carnival with elaborate floats and costumes, the junior parades during the fiesta Mayor and fiesta of Santa Tecla, the Sitges has Talent competition, the junior triathlon and family workshops organized by Museus de Sitges. Sports activities for children are numerous and include sailing, surfing, or joining the many local sports clubs, which include football, rugby, basketball, triathlon and competitive swimming. Sitges has always been characterized by its tolerance, both of the locals and open-mindedness of visitors too. It's definitely a convivial village where all people are welcome regardless of colour, religion or sexual orientation.